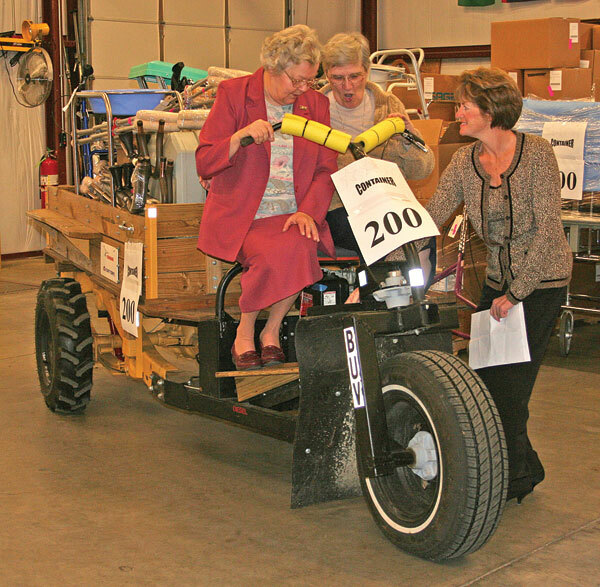 Mission Outreach, a humanitarian effort of the Hospital Sisters of the Third Order Regular of St. Francis in Springfield, recently sent off its 200th container of donated medical supplies and equipment. The container was sponsored by the Poor Handmaids of Jesus Christ for the St. Ann Mission Hospital in Meru, Kenya. On hand to celebrate the sending off of the supplies were Poor Handmaids, Sister Jolise May and Sister Mary Jo Shingler. Sister Jolise, who is general superior of the order and resides in Germany, took a few minutes to talk with the group of volunteers who had come in to help load the shipment. She explained that the Poor Handmaids have been in Kenya for a little over 15 years. “As you grow (in presence as a religious order), the bishops begin to tap you on the shoulder to ask for help,” Sister Jolise said, explaining that they had been asked to reestablish an extremely outdated medical facility. “This part (of Kenya) is a very, very poor area and it is tribal,” Sister Jolise said and then pointing to a pile of simple mattresses, she added, “Even to lie on one of these mattresses will be wonderful. “It will really be Christmas for the people there when they receive this,” said Sister Jolise, of the equipment that is expected to arrive in Kenya in early February. Included in the shipment were items to help build, among other things, an X-ray area and a small operating theater. Mary Mahlie, CEO and executive director of Mission Outreach, said that since 2002 when the first container of donated items were shipped, over $24 million worth of medical equipment has been donated to medical facilities in 58 countries around the world. Note: Mission Outreach will be having a “surgical sort” session during the week of Jan. 16, 2011. Anyone who has knowledge of surgery equipment and would like to help is asked to call Mission Outreach at (217) 525-8843 to volunteer to help sort through donated surgical supplies. This article is reposted with permission from the Catholic Times, Springfield, Illinois.